- When submitting data as JSON, set the headers “Content-Type” to “application/json” in the proxy object and set the encoding to false in the JsonWriter. If not, it will be treated as form submission. - Since I set the auto save to false. DataGrid will submit list of contact when there are 2 or more changes, however it will send a single object when there is 1 change. In order to make it consistent to send as list, set list full to true in the JsonWriter. 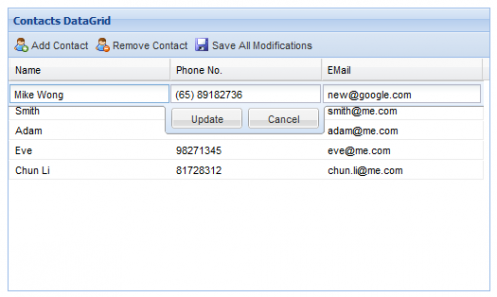 - ASP.NET MVC 3 able to recognize the JSON without additional coding. I was just reading today about yet another site that stored their user’s passwords in plain text. Of course the issue is if you get hacked you expose everyone’s passwords to the world, passwords they might be using on other sites, etc. There is a lot of debate of how you should go about encrypting/hashing/obscuring passwords and with a little research I found a lot of people seem to think BCrypt is the way to go. Check out this article. I won’t debate on what you should use for your website, you need to make that decision. I played with a BCrypt C# library I found on Google Code. 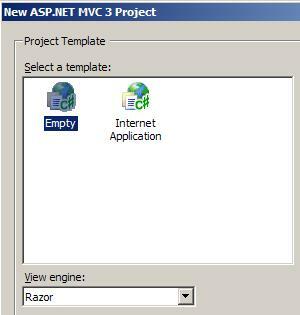 Today I’ll build a simple ASP.NET MVC 3 app that will use it to show how easy it is to work with in a project. Open up Visual Studio 2010 and make sure you have the ASP.NET MVC 3 package installed. 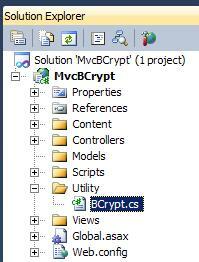 Create a new project: File -> New Project -> ASP.NET MVC 3 Web Application and call it MvcBCrypt. For the project template select Empty. 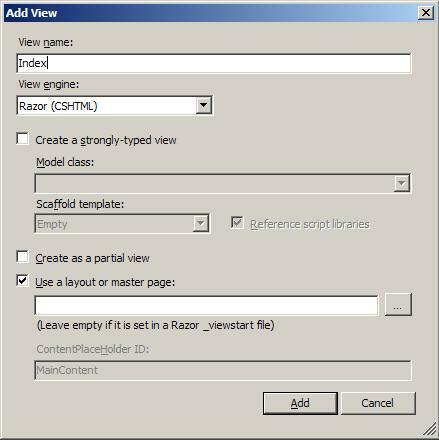 Make sure for the View Engine you pick Razor. Name the new Controller HomeController. When the code shows up right-click on the Index() and choose Add View. Use the default settings (see below) and then click Add. Its time to bring in the BCrypt code now. Go to this link and copy the source code. Create a new folder in your project called Utility and create a new class file in there called BCrypt.cs. Note: Yes, there are better places to put this new BCrypt class file but for simplicity its just going to live in a Utility folder for this demonstration. Note: Using the new Library Package Manager I did see another BCrypt library out there so you might want to experiment with that one as well.